The high temperatures experienced in the Douro mean it is a challenging viticultural site, but one that consistently produces excellent wines. Sally Easton MW reveals some of its secrets. The Douro is one of the oldest vineyards in the world, and it also ranks amongst the hottest, making it a challenging viticultural landscape. Yet the region makes some of the finest still and fortified wines known to man. When all the buzz is about cool climate, why is it cool to be hot in the Douro? 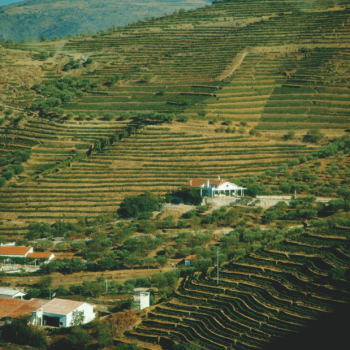 “There’s always been heat in the Douro,” adds Pedro Barbosa, the viticulturalist at Quinta do Vale Meão in the Douro Superior, “and there were no problems like there are today. In the past, people used mixed grape varieties, so problems were not so exposed.” Single-block plantings highlight issues, as do the use of planting particular clones. In a scientifically modulated reversion to older practices, Antonio Magalhães, viticulturist at The Fladgate Partnership, which only makes Port wine, says they “plant in micro-blocks, with the aim of looking after the grapes separately during the year, and to ripen them at the same time. We then pick just-ripe, and ripe, and some overripe” to make the Port blend. Such micro-planning melds with the multiplicity of aspect, for example, taking advantage of the heat-loving Tinta Cão on south-facing plots, and planting wind-affiliated Tinta Roriz on spurs of land, sometimes just a dozen vines in two rows on a tiny plot of particular aspect. It is aspect that Magalhães argues is the most important consideration in an extreme mountainous environment, and it is a factor that cannot be controlled – orography has created 360° aspects. He says: “In the middle of the afternoon, at the same altitude, the difference between north and south is 2°C.” So in a hot climate, Magalhães prefers an east-west orientation where the sun is over the canopy at the hottest time, but he rarely gets this as, because of the mountains, “we cannot choose the row orientation”.